I could swear I read about his death years ago. It would be nice if this new novel has literary value. Among his other works, only the excellent The Caine Mutiny seems to me really worthwhile. 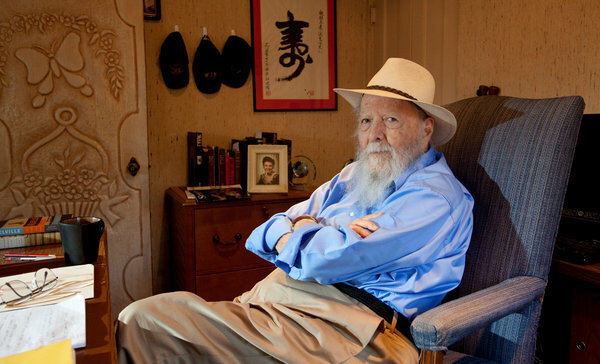 PALM SPRINGS, Calif. — Herman Wouk, the 97-year-old author of “The Caine Mutiny,” “Marjorie Morningstar” and “The Winds of War,” was ready for the interview, his housekeeper announced. Go through the tidy kitchen, past the den with the “I love you, Grandpa” pillow on the recliner, and make a hard right. And there was Mr. Wouk, standing behind his desk with twinkling eyes, offering a sturdy handshake and declaring himself eager to chat about his latest novel. “Let’s get to it!” he shouted cheerfully. This was the notoriously reclusive Herman Wouk? Old enough to remember Simon and Schuster as actual people (“they were as different as chalk and cheese”), Mr. Wouk has written a novel that is startling in its modernity, at least in terms of format. “The Lawgiver,” which arrives on Tuesday, weaves a comedic yarn using letters, text messages, memos, Variety articles, e-mails and Skype transcripts. An epistolary novel, he decided, was the only way to tackle a subject he had spent decades trying to crack: Moses. “The Lawgiver” is a 234-page story about a fictional group of modern-day people making a movie about Moses — with the consulting help of a nonfiction character: Herman Wouk himself, a “mulish ancient” who gets involved despite the strong misgivings of his wife, Betty Sarah Wouk. Intertwined are themes of rekindled love, financial hide-and-seek, religious heritage and familial ties. The novel’s central character, Margolit Solovei, described as the hot Hollywood writer of the moment, comes across a bit like a contemporary rendering of Mr. Wouk’s Marjorie Morningstar, an aspiring actress coming of age in the 1930s. But Mr. Wouk insisted that was not his intention. Mr. Wouk said last week, “I’ve sort of been through the movie mill, you might say,” noting that his house was once owned by Natalie Wood, who starred in the 1958 movie version of “Marjorie Morningstar.” Although he praised Humphrey Bogart’s performance in “The Caine Mutiny” (1954), Mr. Wouk said he soured on “movie people” after the 1964 adaptation of his “Youngblood Hawke.” “It was just awful,” he said. Despite his long experience with Hollywood, Mr. Wouk said he was worried about getting the present-day details right. Do movie executives still read Variety? What about the financial games studios play? “Frank flew down here and said, ‘Yes, this is pretty much how things work,’ which cheered me up to no end,” Mr. Wouk said. “The Lawgiver” may be most notable for its heartbreaking depiction of Mr. Wouk’s relationship with his wife, who died last year at 9o. The couple were married for 66 years, and she was also Mr. Wouk’s agent. Mrs. Wouk is a steely, savvy presence in the book, protecting her husband from outsiders but also nourishing his creativity. Her photograph appears at the end — the same one she sent to him “in a love letter” while he was overseas during World War II. He keeps it framed on his desk. Given her recent death and her lingering presence all around him, both in spirit and in the ceramic cat figurines that line the bookshelves in the hallway, it would be understandable for Mr. Wouk to be sensitive about questions about her. But do not tiptoe around this nonagenarian. O.K., then: after 66 years, how does he manage without her? He confined his comments to their working relationship, recalling how Mrs. Wouk never set foot into his office but played a “mighty” role in his books (18 and counting). For instance, he read “The Caine Mutiny,” for which he won a Pulitzer Prize, out loud to her one chapter at a time as he finished them. With that, he fished a cellphone out of his shirt pocket and summoned his housekeeper, before veering toward lighter topics. Mr. Wouk said he was “tickled” to return to Simon & Schuster, which in 1947 published his first book, “Aurora Dawn,” written longhand while he was at sea during World War II. (He participated in eight Pacific invasions.) Mr. Wouk finds it particularly touching that Jonathan Karp, Simon & Schuster’s publisher, wrote his master’s thesis on his novels. He seemed a touch annoyed with the fascination with his incorporation of newfangled communication like text messages and Skype into “The Lawgiver.” How does a 97-year-old even know about Skype? For 97, Mr. Wouk is remarkably active. His personal trainer comes on Mondays and Thursdays; a yoga instructor swings by on Tuesdays and Fridays. And don’t, whatever you do, ask if he ever plans to stop writing. He acknowledged, though, that he occasionally worried what was left to say. In fact, his next book is already well under way. “I have written a large section, of which I will tell you nothing,” he said, smiling. To tell the truth, the only one of his books I've read is "The Caine Mutiny," and that only after seeing the movie and the stage play, which are what I actually remember. These came at a time when the movie theatres were full of flicks celebrating the military, military men, and wartime virtues - some still known like "Mr. Roberts," some forgotten like "Men of the Fighting Lady" - and this was the only one I can remember to show cowardice in a commanding officer. Only much later did it occur to me that casting archetypal tough guy Humphrey Bogart as Capt. Queeg was a brilliant stroke - credit Stanley Kramer - and that the title is ironic. I also saw "The Winds of War," the TV miniseries with Robert Mitchum, but remember almost nothing about it and never read the book. I read both The Winds of War and War and Remembrance. I could hardly put these books down. The story lines seemed very compelling to me --- made me feel like I had personally lived through WWII. A lot of it was unpleasant (War is hell after all) but worthwhile. However, when I saw the movie version with Robert Mitchum, I was totally underwelmed. If you've only seen that movie and not read the books, you are missing a lot. Get them and read them ASAP!!! !